Matt has built a brand around his birds; selling his designs in big name department stores and smaller independent shops across the country as well as on his own website. His illustrated bird books are a delight for the eyes but are also informative so appeal to bird watching enthusiasts and illustration fans alike. He brings his birds to the masses in his 'Spotting & Jotting' workshops, a feature at fforest Gather 2016 that was a huge success. 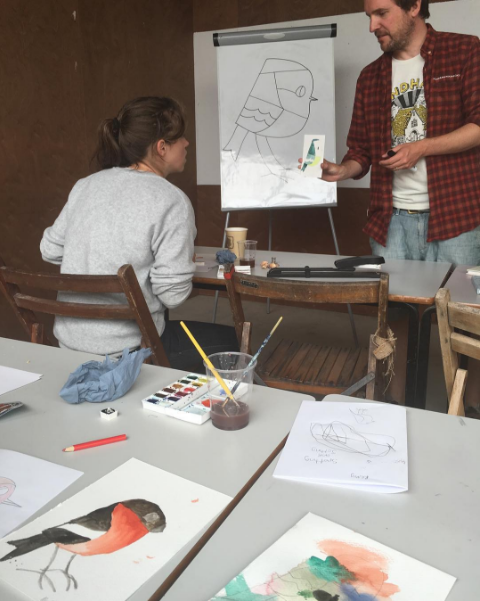 Bringing together grown-ups and little ones to learn about the surrounding bird-life at fforest and to learn how to draw and paint them with Matt. He will be joining us again this year at fforest Gather to share even more of his expert bird knowledge and artistic ideas. Did you do a degree in illustration or did you just have a passion for drawing and birds in particular? I did a degree that focused on animation and illustration and have been a freelance illustrator since the late 90s. Nature and birds in particular have always featured in my work but it wasn't until I wanted to have a bit of a break and a new direction that I started focusing totally on birds, after a year away in Australia in 2007. If you were a bird which one would you most like to be and why? Swallows are cool, they have fun together, are great flyers, look very cool, travel lots and hang out together in a big communal family. Where would you like to travel to study the animals or birds? Is there anything exciting in the pipeline you would like us to mention? My first children's book called 'The Big Bird Spot' published by Pavillion, I have created loads of amazing landscapes to lose yourself in and spot birds and other wildlife. It will be out this spring and I can't wait to see how it goes down!